Sakura Ikeda started learning Shodo when she was six in June, and later got her bachelor’s degree in calligraphy at Daito Bunka University.When she became an independent artist, she started drawing on various materials, such as textile, ceramic ware, and even on Kimono. She incorporated the art of Shodo into everyday life. 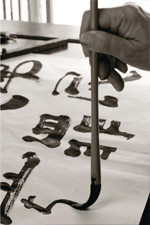 Her works are highly evaluated as art, because they are created on the basis of both her years of study of classic calligraphy and her modern,She also does calligraphy performances on the stage overseas, dynamically making brush strokes to the sound of music. Her lively collaborative shows attract Coming and going freely between the two different worlds of calligraphy, the unconventional and the classic, she explores the depths of the profound world of Shodo.